What is Digital Proof ? What is Printed Proof ? What is Offset Print ? What is Digital Print ? How long will it take to get my order ? How can I get my order even faster ? output, even if I use the same file for order everytime ? Do you only supply the products shown? How well will my job match what I see on my computer screen ? Will you match a sample I printed out on my own printer, or a previously printed sample ? How long does it take to get the proof of the job ? Will I always receive exactly the quantity I order ? What if I want to change something on my order after I’ve placed it or approved the proof ? How will I approve my proof ? Colour will not match print colour, this is because every monitor depending on make and model will show colours differently. This means that the colour you see on your screen probably will not match the colour that will be printed by an offset printer! When the file is outputted to film information and layout integrity may be lost and will not be picked up until the job has already been printed. Once you have received your proof you will be able to go over everything and double & triple check layout, textual content including spelling and grammar as well as image and color quality. A proof with signed off and date, this will become very much like a contract which will protect both you and the printer if something goes wrong during the printing process. At Mute Solution, customers can require a printed proof (A printed proof cost will be applied at customer expense) to ensure that your product gets printed correctly the first time, everytime. Offset is usually looked at as the higher quality choice and consistently high quality images. Offset printing makes images and lines sharper more easily than other printing methods. Offset printing prints PMS colours easier and reproduces solid screen tints better. Offset prints higher quantities at much less cost than digital printing. The cutoff is usually anywhere from 500 to 2000 sheets. Quantity and timeframe are usually the deciding factors in whether to use offset printing vs digital printing. Offset printing gives you much better options of printing larger sheets as long as you are doing more than a few of any item. Digital printing is used primarily when you need something very quickly or in very small quantities. Digital printing also gives you the opportunity to print variable text or images where each sheet off the press is unique in some personalised way. Once a sheet is off a digital press it can be cut, folded or finished very quickly where offset printing must dry or be coated before handling. There are very few digital presses that print true PMS colours or Spot Colours. CMYK is what the colour process that forms the basis of printing (Offset printing presses and digital printing machines).This acronym stands for the four colours of pigment: Cyan, Magenta, Yellow and Black. It can also be referred to as “four colour process” or “full colour process”. Combinations of these four colours creates the full range of colours that you see in printed material and results in a smooth, continuous tone. RGB is what the colour display on the computer screen. It is recommended that you convert your images to CMYK before sending the print files. Doing this will allow you to tweak any images that do not convert well and have a different appearance to their RGB originals. Unfortunately, not all RGB colours will convert well to CMYK – these colours are said to be “out of the CMYK colour gamut”. To accommodate for this, you should convert your RGB images in your favourite imaging program (e.g. Photoshop) and check them against the original RGB image. It is at this stage that you can tweak the colours if you find that their appearance is dull or not as you expected. If you do not convert your images to CMYK before sending them to us, we will run a script in Adobe Acrobat that will convert them to CMYK, however we generally do not check the images after the conversion as this would be far too time consuming (especially to make any colour tweaks that might be necessary), so we recommend you convert your images before sending your files to us. Below is an example of colours that do not convert well from RGB to CMYK. It is generally these vibrant, flat colours that suffer the most during the conversion process. Photographs and images with continuous tone generally convert much better. “Bleed” is an essential part of creating artwork for print. Professional designers will always extend (or ‘bleed’) background elements and images beyond the edges of the document by an additional 3mm or so. This prevents unwanted white borders around the edges of a printed document. The commercial printing presses are no different to your desktop inkjet or laser printer – they cannot print to the very edge of a sheet of paper. To get around the problem, we print your design onto a larger sheet of paper and then cut it down to size. But here is an issue you need to be aware of. Most conventional and digital printing presses suffer from slight sheet-to-sheet mis-registration. In other words, due to slight movement as the paper passes through a press, your design may not be printed in exactly the same position on every sheet of paper. We’re not talking about much – usually only fractions of a millimetre – but the accuracy differs from press to press and is usually more evident on digital presses. That’s not all. When the guillotine operator is trimming your design down to size, it would take someone with an incredible aim to cut exactly along the edge of your design. Any press mis-registration would make this job impossible. So what does he do? If he cuts into the design there’s a danger that text or graphics close to the edge of the sheet will be lost. Cut too little off and you’ll end up with a white border on at least some of the prints. To get around this problem, designers use bleed. This simply means that they extend beyond the edge of the document (by between 3mm and 5mm) any elements which should touch the edge of the paper. As a result, any inaccuracies which occur during the printing or finishing process shouldn’t cause any problems. Designers are also careful to avoid placing important elements such as text within around 5mm of the edge of the paper. It not only looks unprofessional and cramped, there is a risk that it could be cut off! This area is sometimes referred to as the ‘quiet’ area of a design. 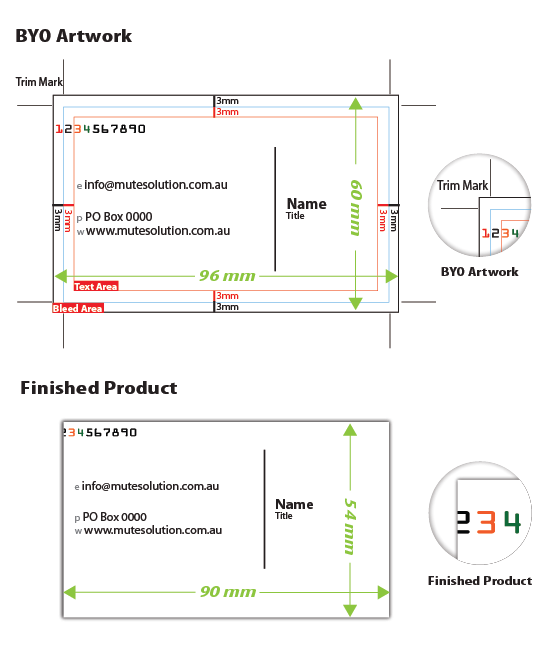 * Example: The standard size for business card is 96 x 60mm (include 3mm bleed each side), actual finished size is 90 x 54 mm. * Please be noticed the possible area trim away in between 3mm bleeding and 3mm from Trim Mark. Most jobs will take 5-7 business days after you approved the artworkproof from us. Please check the product specifc for available turnaround times. Shipping time is approximately 2-3 days for most major cities in Australia and 3-5 days for the rest area. Please contact us for International shipping time. Our standard service is quite fast. For most products we ship your order within 7days after you approved your artwork. In most parts of the country, that means you will have your order in about 7-10 days. If you want to receive your order faster, please contact us for our faster handling options or Express services options,please aware the additional fees will be applied when you place your order. We can organize to ship to you anywhere around the world. Please provide us the exact shipping address (street address if available), along with the quantity and product type you want to order, and we will let you know the additional shipping costs. Please note that some services are not available to all countries. Please contact us for shipping services. Why do I have different output, even if I use the same file for order everytime ? Because of the limitations of printing technology, the output will cause 10 -15% color difference for each time you print. It’s deemed reasonable within the printing industry standard. Do you only print the products shown ? If you’re looking for something specific and can’t find it on our site, please don’t hesitate to send us an email explaining your precise needs. We’ll then try our best to help you as far as we can. Most people are surprised at how well their job matches what they see. But because of wide differences in monitor calibration and the different technologies used, some printed colors may not exactly match the colors on your specific monitor. Please see our What is CMYK Information. Will you match a sample I print out on my own printer, or a previously printed sample ? There is no guarantee that your finished piece will approximate your printed sample. This is due in part to the widely varying results from different output devices including inkjet and laser printers, continuous tone proofing devices, high-resolution film-based proofs, and different than true offset lithography. Even from one commercial printing firm to another, there can be significant differences in results. In particular, inkjet and laser prints are known to look substantially different than true offset lithography. If you require precise color match, please contact us to arrange for a digital color proof. Once you approve the additional fees (starting at $80), we will produce a print proof for you. When you approve the proof, we will strive to match the color of the proof when printing your final piece. There are substantial additional charges for precise color match service. Also, if you request color correction or other changes after you see your proof, there will be a minimum of another $80+ charged for color correction time and a new proof. Bottom line: the final product we produce for you is unlikely to match the output from your inkjet, it will look more professional! Once you have placed your order, you should get it within 1 business days after we receive your artwork. Most of the time, we ship you slightly more than you ordered, free of charge. On occasion, we ship slightly fewer pieces than you ordered. Printing industry trade standards allow for underages of up to 5%. If you plan to send your print order to a mailing list or need a guaranteed quantity, we recommend that you order 5% over the minimum quantity you need. You may make changes to such things as artwork, quantity, shipping method, or shipping address by contact us. Please note that some changes cannot be made after certain stages in the production process – for instance, the quantity cannot be changed once your job has been printed. We will email you a digital proof (an artwork approval form) to get your approval by replying the email to us. In addition, if you require a printed proof, you are required to signed off the proof. There is 30% cancellation fee of the order will be applied if the order is before press. There is no cancellations or refunds will be available once the order is on press. We do not accept any returns or refunds for any errors other than color or text made by customer provide artwork.